Do you have complex data and no way to obtain meaningful insights? You understand your data, but you don’t have a way to clearly see how you’re performing against your goals and objectives. A dashboard is more than a pretty image. They are business intelligence tool that display data visualizations in a way that is understood instantly. Dashboards provide an objective view of performance metrics and serve as an effective basis for further discussion. With an effective dashboard, the organization can quickly understand issues the data is showing and realize what steps to take next. 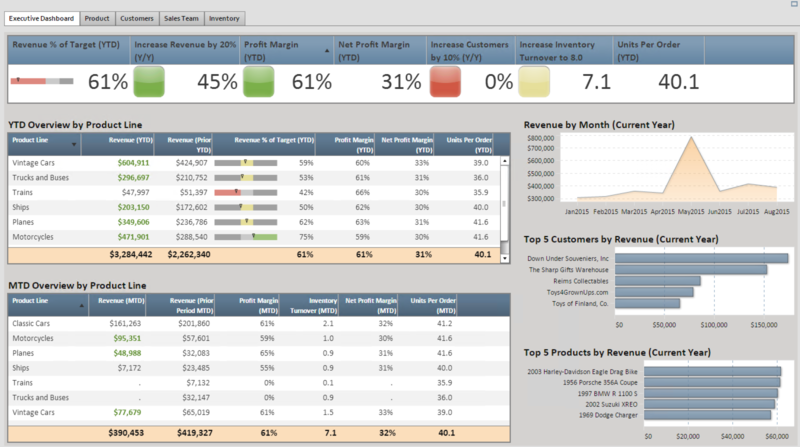 Here’s an example of an Executive Dashboard that contains the performance metrics for revenue, customers, and operations. With so many dashboards available, choosing an appropriate one often boils down to the users of dashboard tools. Our dashboard experts are here to help! Our experienced consultants can partner with you, as a team, to determine the business objectives and the most effective dashboard type. We develop the custom dashboards while collaborating with you at each stage. Our specialty is interactive dashboards that encourage users to explore and learn from their data. In this dashboard, the Customer Service team can explore the overall organizational trends along with the specifics for each team. This dashboard allows a drill-down to specific metrics. And don’t worry if your team doesn’t have the right tools, we can assist with implementation and even hosting services. Our dashboard development process ensures that your organization always gets an effective result. We work with your team to determine the right metrics for the dashboards and agree on a content strategy to guide the dashboard development. Before starting the dashboard creation, we provide a wireframe design, so your team understands the dashboard layout and information pathways. This process ensures all issues are addressed and shortens the overall development time. Then we transform your data from any source to ensure a clear, accurate answer is available to your end users. Customers with complex databases appreciate how quickly our team can simplify this maze. We schedule data refreshes to ensure to ensure the dashboard is continually updated. Adoption is the key ingredient to having a successful dashboard. Our team assists the end users with training to ensure the organization benefits from the dashboards. Once the dashboard is available, we meet with your team on a regular basis to ensure the work meets the ongoing organization needs.